The sheer size of an email archive can dwarf that of the live Exchange system by a factor of 10, 20, or 30X, so a great deal more data will need to be migrated. Regulatory compliance requirements should be taken into consideration to ensure regulated data is not lost or misplaced. Legal responsibilities, such as litigation hold, ensuring data remains in its original format, and guaranteeing metadata is not altered in any way are an absolute must. The existing on premise email archive is 25 TB in size. 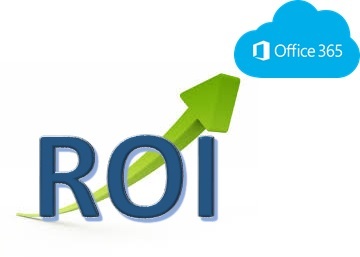 Based on the basic fact that the only real cost of moving your existing email archive to Office 365 is the migration itself and the fact that once in Office 365, there is no ongoing costs for the archived data, the actual ROI is calculated from the cost of the actual migration versus the ongoing projected cost of keeping the on premise email archive. 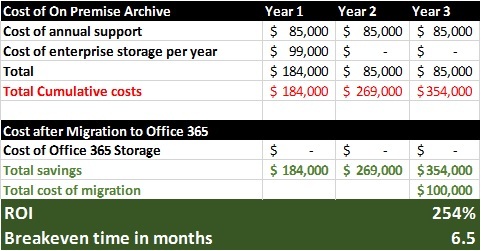 Looking at the table above, we see that the 3 year cost of keeping the on premise email archive is $354,000 and the cost of migrating it to Office 365 is $100,000 (keeping in mind the ongoing cost of the archived data, once in Office 365, is zero). With these numbers we can calculate the return on investment (ROI): ($354,000-$0.00)-$100,000)/$100,000 = 254%. We can also see that the breakeven time of the investment is 6.5 months. Considering the above results, migrating your legacy email archive to Office 365 is a great investment! Archive360TM is the market leader in email archive migration software, successfully migrating more than 12 petabytes of data for more than 500 organizations worldwide since 2012. The company’s flagship product, Archive2AnywhereTM, is the only solution in the market purpose-built to deliver consistently fast, trouble-free, predictable archive migrations, with verifiable data fidelity and defensible chain of custody reporting. A global organization, Archive360 delivers its solutions through a network of specialist partners. Archive360 is a Microsoft Cloud Solution Provider and the Archive2Azure solution is Microsoft Azure Certified.